Welcome to the Mabon Blog Hop. I'm super excited to be participating in this hop because Autumn is my absolute favorite time of year. Our wranglers,Jenn Waltner and Louise Underhill, have challenged us to post on the theme of balance and how it can be restored. 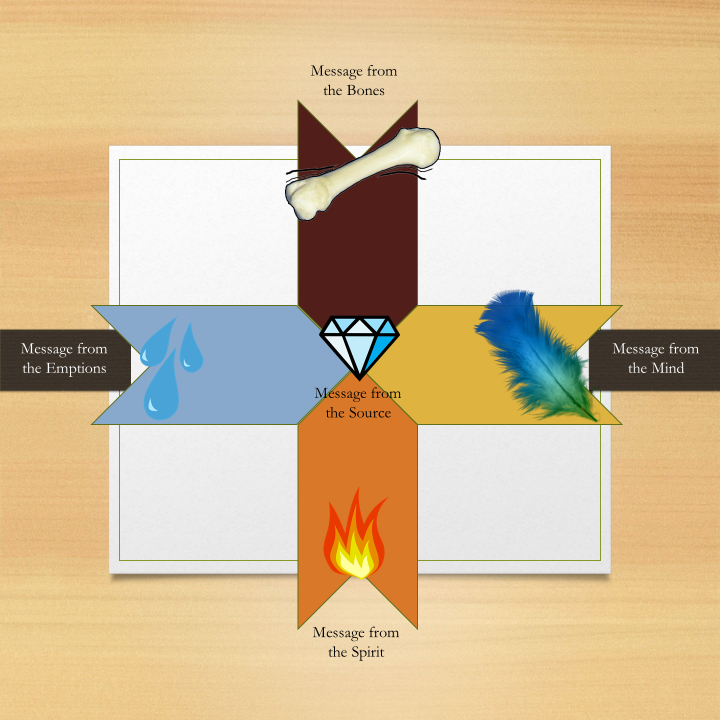 I've decided to use a spread I created to ask the elements for guidance on how I can bring more balance into my life. 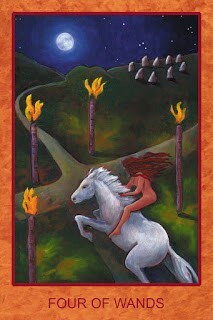 I'll be using the Tarot de St. Croix for my spread as this deck always makes me think of Fall. The seven of swords, as interpreted by Lisa de St. Croix, tells me that I need to clear space in my life for what is important and I need to focus on my goals. These are important messages as I am getting ready to embark on a serious effort to lose weight and I need to really focus on this goal and to make time in my life to exercise and pay attention to what I eat. The more traditional meaning of the swords, stealing or retrieving something, is also valid in this reading as I'm taking back my health. This card also dovetails with an emotional journey that I've been taking to heal from ancestral damage. I grew up believing that my weight was a function of genetics and that there was nothing I could do about it. However, when I look back at my mother's eating habits, I realize that she was trying to lose weight while eating cookies, soda, and other unhealthy foods. In hindsight, the messages about not being able to lose weight because of genetics, do not match up with the eating habits she demonstrated. The fool tells me that I need to let go of my need to know my destination and to just trust that I will be taken where I need to go and provided with what I need. This is a very apt reading for me as I am a control freak and it is hard for me to embark on journeys with uncertain outcomes. It's very interesting that I pulled this card as the message from the mind, because I'm applying for a graduate program in Spirituality, Culture, and Health and the rational part of my brain that I have always relied upon to make decisions is telling me that there is no return on investment in this program and that I will be wasting my money. However, my heart is telling me it is right for me and that it will lead me someplace amazing. This card is an affirmation that I need to just leap and trust that the path will unfold. The World is telling me to embrace all of my emotions and to not segregate them based on what I believe are good or bad emotions. All of my emotions can help me to grow and to become my best self. The world is also telling me that by opening my heart to embrace my own emotions, I can be connected to the all of my brothers and sisters in spirit around the world. This message is incredibly timely for me as I am someone who shields herself and doesn't like to open up to the world around me. I need to be like the world and stand naked in the middle of my own world and own it. I need to own who I am and what I feel. The four of wands has many messages for me. The first is that I will find my own personal power by creating a life of ritual. I need to live in sacred space as that is where I find my own sanity and healing. This card, like the World card, is also telling me to be naked and vulnerable as I move through life. I need to be open with other people and to stop hiding who I am. Lastly, Epona is telling me that I am at a crossroads and I have a decision to make as to where I am going moving forward. Overall, these were incredibly powerful cards to draw and provided a lot of guidance as to how to move forward with my life over the next few months. The graduate program sounds like an awesome opportunity! Thanks for sharing your spread. thank you so much. I'm so excited about it. I love your thoughts on your lessons on dieting and eating from your mother. Excellent. This was a very good reading. Love how you navigated the compass points. I love this spread. .. it is so obvious really, I don't understand why I never though of it! Yep, loved the balance of the four directions and the messages it gave you to allow some stuff. :) Nice spread, indeed.